are epiphytic plants that are native to the tropical jungles of Brazil. The Dwarf Easter Cactus, Rhipsalidopsis rosea produces soft pink, 1"-2" flowers. Rhipsalidopsis gaertneri produces bright red flowers that can reach 3". to create many new varieties in colors ranging from pure white to bright purple. Both species of Easter Cactus bloom early in the spring, and will occasionally flower again in the fall. but they are reasonably easy to grow and maintain as house plants. close to their native habitat... Fortunately, however, these plants are quite willing to adapt. In the garden, Easter Cactus should be grown in planters or hanging baskets in dappled to full shade. They will tolerate some morning or late afternoon sun in coastal or temperate regions. but never in full sun, in an area with good air circulation. but to thrive, they need daytime temperatures of 70°-80° with 10° cooler at night. 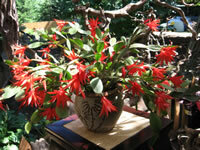 Excellent drainage is essential for both the planter and the planting mixfor your Easter Cactus to survive. 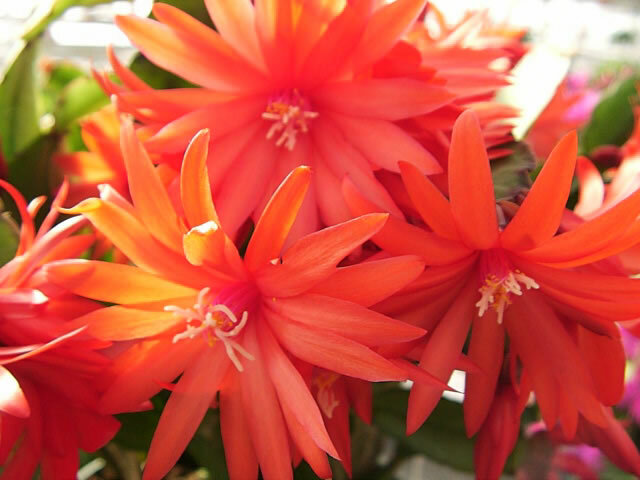 Easter Cactus should be grown in a light, fast draining, peat moss based planting mix with coarse builders sand or perlite added. 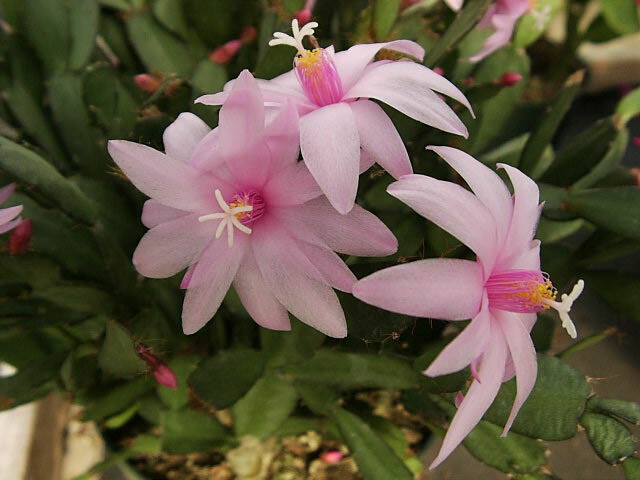 Water actively growing Easter Cactus thoroughly when the top inch of soil becomes dry to the touch. Never allow the pot stand in water for more than an hour. Waterlogged soil can quickly lead to root rot and disease. using a soluble fertilizer with an NPK ratio of 10-10-5. Rhipsalidopsis plants will become semi-dormant in the fall and winter months, while they are setting new buds. During this time, they should be kept in a cooler spot (50°-60°) and watering should be cut back to once or twice a month. Easter Cactus bloom best when they are somewhat rootbound and crowded, but they should be repotted in fresh potting mix every other year to a pot that is one size larger. Repotting should be done in mid-summer after blooming or in the fall. 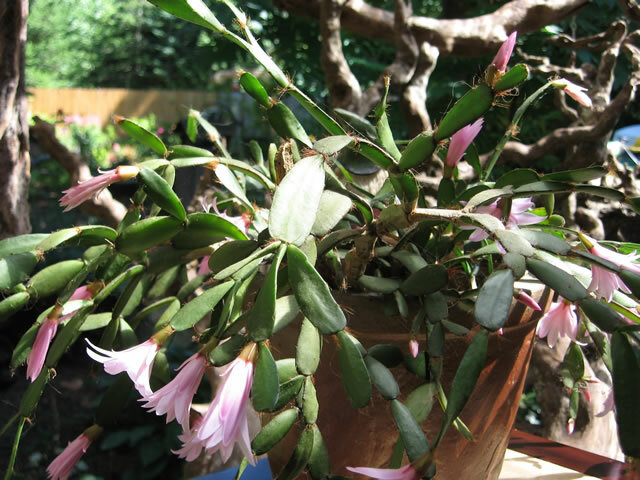 Easter Cactus can be easily propagated by cuttings of segments taken during the summer after your plant has finished blooming. Cut or gently twist off single or multiple segments from the tips of the healthy branches. Be sure to keep track of which end of the cutting is 'up'. Set the segments in a cool, dry location for several days, to allow the cut ends to form a callous. Insert the base of the cutting ½" deep in moist sand, perlite or vermiculite mix. 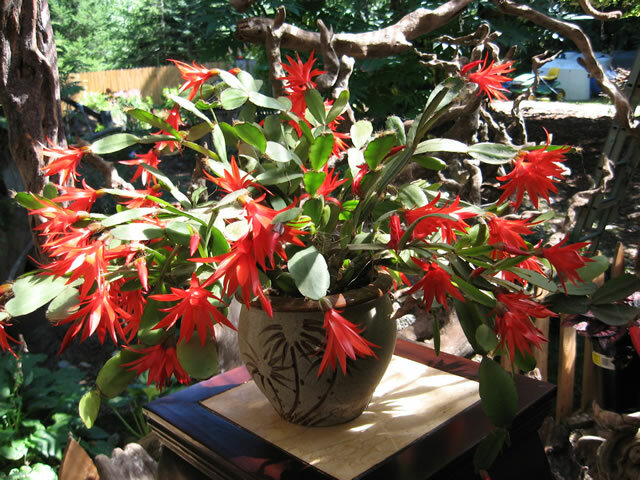 When the new roots are well established, move your new Easter Cactus to an appropriate container in a rich, fast draining potting mix.